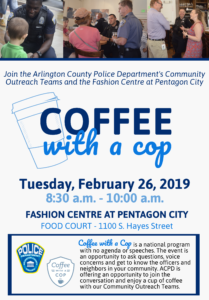 ARLINGTON, VA – The Arlington County Police Department, in partnership with the Fashion Centre at Pentagon City is hosting its next Coffee with a Cop event on February 26, providing the public with an opportunity to meet and interact with the department’s Community Outreach Teams. Coffee with a Cop is a national program with no speeches or agendas. It serves as an informal event for members of Arlington’s residential and business communities to ask questions, discuss their public safety concerns, get to know their neighbors, interact with the Community Outreach Teams and meet officers from other sections of the department. The Arlington County Police Department is committed to continuing to build and maintain valuable relationships with those we serve, a strong component of ensuring the public’s trust. 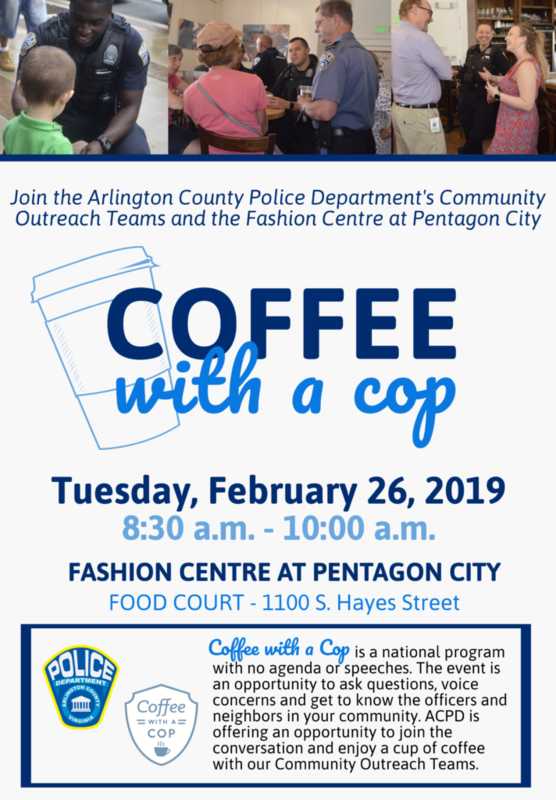 The department works proactively to engage with all who live, work or visit Arlington County and Coffee with a Cop provides a unique opportunity to strengthen these partnerships, one cup of coffee at a time.